One friday afternoon, Gerben van Beek, called to ask me if I had plans for the Saturday. 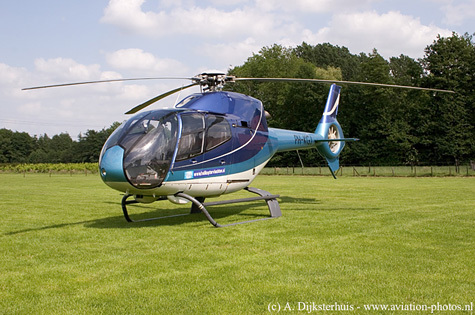 Gerben works for Heliflights on a part-time basis and invited me to join them on some sightseeing flights over the South of the Netherlands. 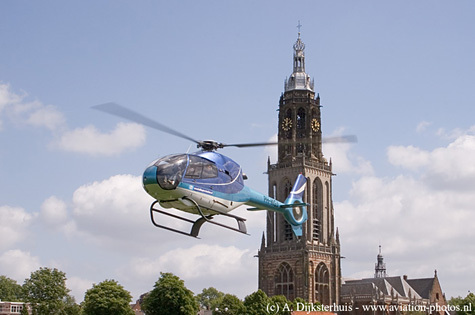 Several sightseeing flights were scheduled at Rhenen and at Moergestel, a small village just beneath ‘s Hertogenbosch. 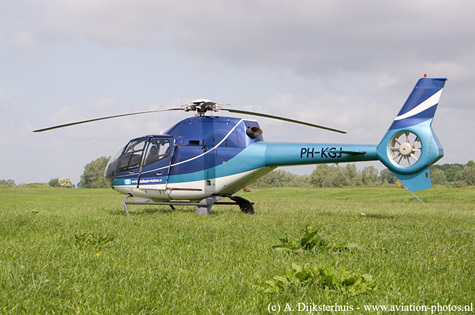 Heliflights is based at Ede, and operates an EC.120B Colibri, registrated as PH-KGJ in the Dutch civil aircraft register. 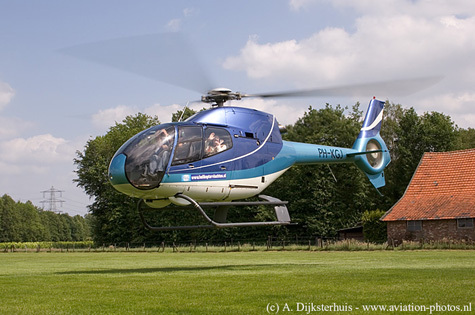 This Eurocopter EC.120B was built in 2001, and carries up to five persons, including the pilot. 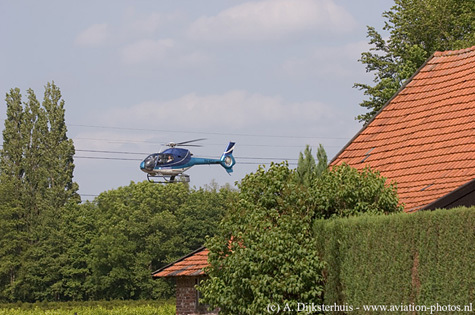 Sightseeing flights for example are flown from (temporary) helispots situated near e.g. a restaurant. 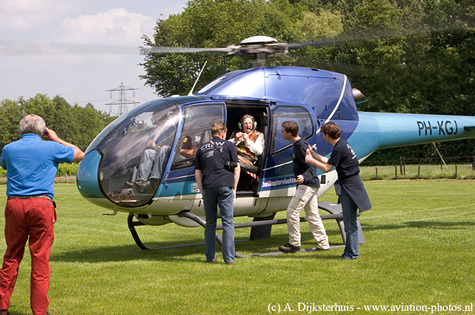 After a twelve-minute flight, we arrived at Rhenen, where we landed in a field close to a restaurant, just outside the city. Our landing was watched by a few tigers and a giraffe from a circus that happened to be camped next to our landing spot. Several flights were scheduled. People can book their flights online, and choose a 15-minute or a 30-minute flight. After a few local flights, the journey continued at about one thousand feet with a speed of 110 knots as far as Moergestel. We landed on a local soccer field, after about twenty minutes flying. This site too was close to a restaurant where we all had light meal. The weather was good, with only a few clouds. Both young and old took advantage of the opportunity to fly in a helicopter, and one small kid who knew all about the Chinook and some other helicopters made his maiden flight. A grandfather enjoyed his first helicopter flight on his 80th birthday, and a grandma of 93 years made a thirty-minute flight. 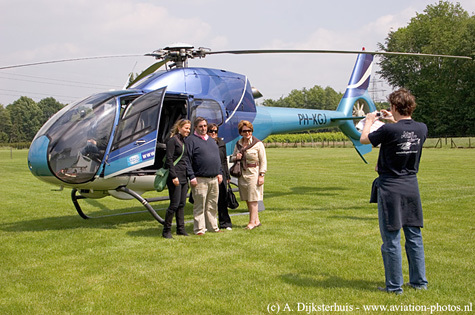 The old lady told us that, ever since she had been a little girl, it had been her wish to fly in a helicopter. All returned with broad smiles on their faces. Around five o'clock, the Colibri returned at Moergestel for the last time that day. After the last group to arrive had been helped out of the helicopter, we quickly got on board for our last flight of the day, heading towards our final destination: homebase. 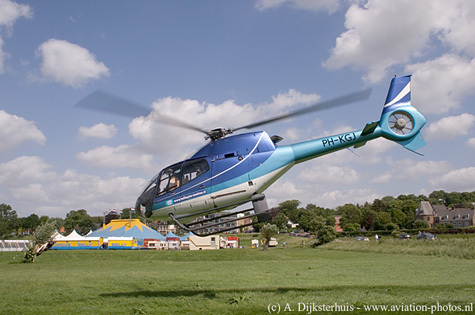 We arrived within a half an hour, and Alfred Huitema landed us on a mobile helipad. Gerben and Harry soon parked the EC.120 inside the hangar. A few minutes later the lights went dark, the door was closed and we left, leaving the pilot behind to do his paperwork. The end of just another Saturday. Well, for them. The author thanks Heliflights, Gerben van Beek, Harry van Voorthuizen, Alfred Huitema and Jelle Smouter for making this experience possible. This article was published in the Autumn 2007 edition of Helicopter Life.